It’s been bitterly cold the past few days. I’ve been bundled up in my puffy winter coat. My head, hands and feet covered with hat, mittens and boots. 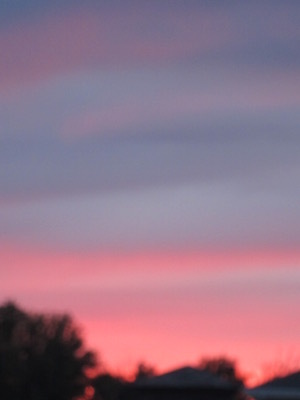 This afternoon as I was bracing myself in the cold, pumping gas with the wind whipping around me, I turned my head to see… the sweetest pink sunset blessing the western sky. Embrace the contrasts in your life today. •	Warm your cold hands against cup of hot cup of cocoa. •	Step out the door into the frigid air and take a brisk walk that makes you all sweaty. •	Sit by the fire or snuggle up with your comforter and drink a cold glass of water. Invite the cold of winter to reveal the warmth in your life.